America lost 20,360 children and teens in 2016—60 percent of them to preventable injuries, a new study shows. More than 4,000 of them died in motor vehicle crashes, though prevention efforts and better trauma care have cut the death rate of young people from such crashes in half in less than two decades. 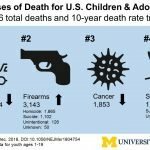 Meanwhile, firearms—the number two cause of death in youth—claimed the lives of more than 3,140 children and teens in 2016, according to the new findings from a University of Michigan team. Cancer, which accounted for 1,853 deaths of those age 1 to 19, comes in third place, and its death rate has dropped since the start of the study period. Suffocation—mainly suicides by hanging and other means—was fourth, and is on the rise. Those causes are followed by drowning, drug overdoses/poisonings and birth defects, each with just under 1,000 deaths and steady decreases in death rates over the last 17 years. Motor vehicle crashes kill nearly three times as many children and teens per 100,000 in rural areas, compared with in urban and near-urban areas—even when the researchers adjusted the data to account for the extra miles traveled each year by drivers in rural areas. Next Next post: Can Facebook advertising prevent cancer?